Dr. Faith Lotsikas is passionate about providing rehabilitation therapy to improve quality of life for dogs of all ages and athletic abilities. She enjoys working with senior patients to improve comfort, mobility, and overall wellness. For pre- and post-surgical patients, she is dedicated to minimizing recovery times and maximizing outcomes for return to normal life. As an avid follower of canine sports, Dr. Lotsikas understands the unique physical and mental requirements of working and sporting dogs, and creates specific fitness and return-to-sport plans tailored to each individual human-canine team. Dr. Lotsikas prides herself on great instincts, sensitive hands, and open, collaborative communications with each patient guardian. Dr. Lotsikas earned her DVM degree from the Virginia-Maryland Regional College of Veterinary Medicine in 2002. She then entered an equine internship in Ocala, Florida, which focused heavily on sport horse lameness and surgery, furthering her interest in the musculoskeletal system. Dr. Lotsikas has practiced small animal medicine in a variety of settings, including Humane Societies, private practice, and emergency hospitals. Within these institutions and their diverse patient populations, Dr. Lotsikas recognized both a need for alternative options for geriatric and arthritic patients, as well as the importance of rehabilitation therapy for patients following surgery. In 2009, Dr. Lotsikas completed her advanced training in rehabilitation therapy through the Canine Rehabilitation Institute. Since that time, she has worked with Veterinary Orthopedics and Sports Medicine Group, and founded/developed a rehabilitation department within a referral hospital. For the past year, Dr. Lotsikas has been dedicated to her own LLC, Faithful Paws Veterinary, providing performance dogs with rehabilitation therapy for sports-related conditions, wellness and optimized condition maintenance, injury prevention training, and fitness consults. She has also continued to provide quality of life options for her senior and special needs patients. Dr. 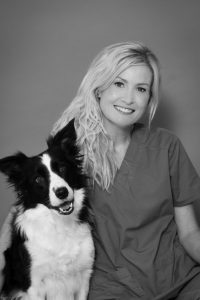 Faith Lotsikas provides her services at Skylos Sports Medicine with her husband, Dr. Peter Lotsikas, and as a true team with complimentary talents, they will continue to offer their combined expertise to help dogs of all walks of life. Dr. Faith has authored numerous articles on rehabilitation topics and continues to lecture for national-level veterinary continuing education seminars. She also enjoys teaching workshops with local agility, herding, and SAR groups on injury prevention and fitness. At home, Dr. Lotsikas is mom to three little girls, manages a small sheep farm with the help of her very clever Border Collie Kelsea, and is an amateur artist and medical illustrator. She enjoys attending canine and equine sporting events. Can’t say enough good things about this vet. They really know working dogs. Took great care of Ghost.